Compost is a very important soil amendment here in North Texas. While our heavy clay soils may be rich in nutrients, those nutrients are often bound up and unavailable to plants due to the composition of our soil, compaction and a lack of bioactivity due to over-use of synthetic chemicals. To keep your soil healthy, full of microbial activity and able to better retain moisture, you can add organic compost to your soil in late-winter, early-summer and early fall. Our liquid compost extract, which is part of our Soils-building program, is also an excellent liquid feed for your soil and landscape. You can make your own compost at home, which helps keep a lot of waste out of the city landfill. While composting can seem very technical and complicated, there are some very simple steps you can follow to get a good start on your own compost. Pick your site. Choose a location with at least partial sun exposure that is level and is close to your garden beds. Compost that receives some direct sun and warms faster will break down faster. You only need about a 3-ft by 3-ft space to get started with one compost pile. Purchase or make a compost bin. Purchase a tumbler or a sturdy compost box from your local garden center, or make your own out of recycled wood and wire. You can find many plans online – check out our Composting board on Pinterest. Add materials to the pile. You’ll need carbon and nitrogen rich ingredients, which are referred to as “browns” and “greens”. Carbon-containing items (browns) include brown dried leaves, old dried weeds or small trimmings, shredded newspaper, bits of cardboard, small amounts of wood ash and even scraps of fabric. Nitrogen-containing items (greens) include grass clippings, fresh weeds, any herbaceous plants you've pulled from your ornamental or veggie beds, vegetable kitchen scraps, animal manure (chicken, rabbit, horse, cow), and used coffee grounds. Build alternating layers of “browns” and “greens” in 3-inch layers. Avoid adding large cardboard boxes or large sticks and twigs as they will take a very long time to break down. Shred or chip these items so they will break down faster. Keep a small composting bin in the kitchen to collect keep scraps, then empty into compost bin every few days. Enrich your compost by adding compost activator or earthworm castings. You can even add a few handfuls of existing soil from your landscape. This soil will already have beneficial microbes in it that will help jumpstart your compost. Lightly moisten each layer after adding it to the pile. Do not soak! Your compost should be the consistency of a damp wrung-out spong. Too wet, and your compost will turn anaerobic and smelly. Too dry, and your compost won't break down properly. Turn your compost weekly for faster production. 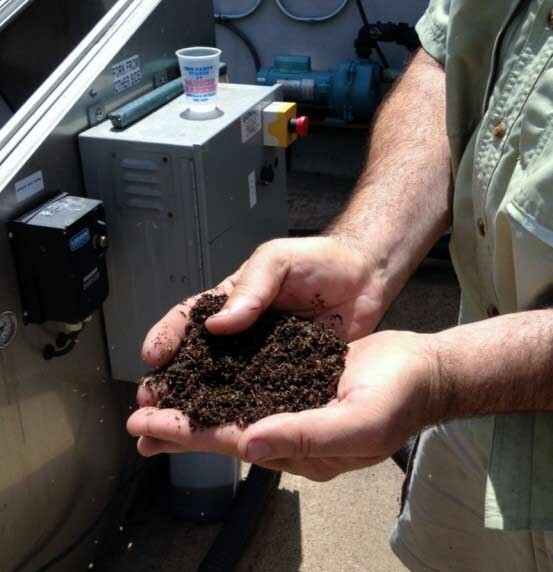 We compost locally recycled organic matter to create our organic liquid compost extract fertilizers. You can read more about how we do this here. Start this weekend and you could have compost in just a few months! Have questions about making compost or what you can and can’t add to the pile? Ask us on Facebook.